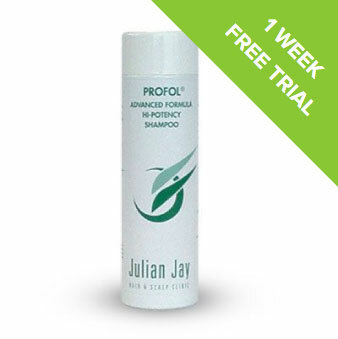 A ONE WEEK TRIAL SAMPLE OF OUR INCREDIBLE ADVANCED FORMULA HI-POTENCY HAIR GROWTH SHAMPOO WORTH £5! Yes thats right, a trial sample! Why are we doing this you may ask? Well its simple. We know that our treatments work and we want to prove it to you. Of course you cant expect to start new visible growth in just one week, it would be ridiculous to expect it. What you will notice is a significant reduction in excessive hair loss, that will lead to new growth in the future and the wonderful thing is, it is suitable for both men or women. How will you know that its working? Let me assure you that you will be left in no doubt! After using the shampoo you will notice reddening on and around the applied area and a mild warm, tingly, slightly sensitive sensation to your scalp. This is your proof that the formula is working, improving the blood supply to your scalp and helping to overcome the damaging effects of Dihydrotestosterone ( DHT ) build up that is stopping your hair growth and causing your hair to thin. Why wait! Act today. You have nothing to lose and everything to gain.